How Far is Jayabheri The Summit? Jayabheri The Summit, by Jayabheri Properties Private Limited, is a luxury complex with apartments for sale in Narsingi, Hyderabad. The HMDA Approved Jayabheri The Summit is a high rise luxury project by Jayabheri Properties. The high rise apartments for sale are well ventilated and well lit. Spread over 7.26 acres, Jayabheri The Summit, has about 75% open area and 25% built up area. The open spaces have well manicured landscaping. 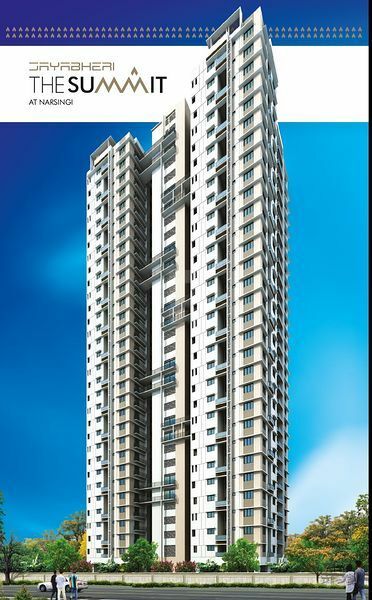 Jayabheri The Summit boasts of 5 towers, each with 30 floor classification. The well defined reception area, glittering lobbies, hi-speed lifts will remind you of 5-star ambience. Jayabheri The Summit, in Narsingi, Hyderabad is an ongoing project which hosts a total of 750 units of 3BHK apartments for sale. 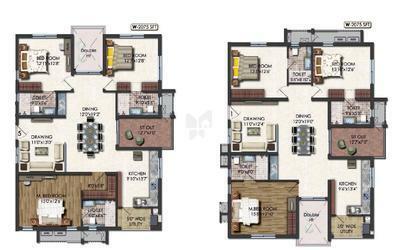 The 3BHK apartments are of sizes varying from 1860 sq. 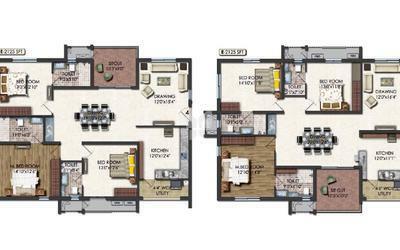 ft. to 2125 sq. ft. The corridors that lead to the apartments are sunshine soaked. 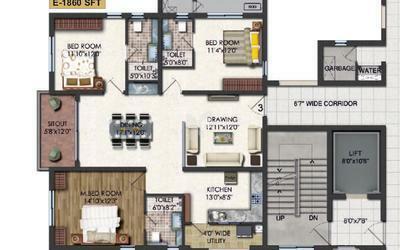 The living spaces are wide and well proportioned. The design allows for social spaces to connect, rejuvenate and unwind your body, mind and soul. The area of Narsingi, Hyderabad is a suburban space. Narsingi receives a healthy demand for residential properties due to the availability of quality housing in all budget categories as well as luxury apartment categories. There are many International Schools, Colleges, Hospitals and recreational places nearby, adding to its charm. The luxury apartments for sale in Jayabheri The Summit, Narsingi, Hyderabad, enjoy all the benefits of the area. The world class amenities and the Community spaces combined with elegant interiors make owning one of these apartments a dream come true. Exclusive amenities like Double height balconies, Amphitheatre, Tennis court, Library, ATM, jogging track, indoor games etc. bring in a world of freedom in home. “A real building is one on which the eye can light and stay lit.” True to this quote, Jayabheri Properties exercises its Design Philosophy. They believe that places that people call “homes” , should be a place where form and function work in harmony. Exceptional design by Jayabheri Properties strikes the balance between comfort and luxe, the practical and the desirable. Jayabheri Properties Private Limited was founded in 1987 by Mr. Murali Mohan along with Mr. Kishore and Mr. Ram Mohan, in their quest for creating a world-class real estate company. Since its first project, Jayabheri Properties, has created landmarks in the city of Hyderabad. At Jayabheri Properties, they believe that well-designed spaces have the power to transform lives. They understand that people positively connect with the spaces that they live in, work, socialize, think and relax, when it has been diligently designed. Ready to Occupy projects like Jayabheri Temple Tree in Narsingi Hyderabad and Orange County in Gachibowli, Hyderabad are prime examples of well designed communities by Jayabheri Properties. As the chief architect and promoter of the company, Mr. Murali Mohan is driving the vision and the purpose of the company. Clients, associates and all stakeholders in the ecosystem have come to recognize the values driven approach of the company. Ongoing projects like Jayabheri The Summit in Narsingi, Hyderabad and Jayabheri The Peak in Narsingi, Hyderabad are still upholding the values of the group. Creating exceptional projects and neighborhoods that truly enhance the quality of life and work. To continuously innovate and create new benchmarks in design, aesthetics and lifestyle quotient of their projects. Quality: To ensure that the company name is synonymous with the best quality products, materials, plans and concepts. To deliver high quality consistently in every project. Transparency: To be transparent in every interaction and documentation, with customers, vendors, associates or investor community. Integrity: To always work and deliver projects with high integrity and to adhere to highest ethical standards at the lowest employee level. Innovation: To continuously innovate in every aspect of conceptualization, planning, architecture and design. To benchmark against the best practices globally and create spaces that enhance the quality of human-space interaction.